Award winning photographer Julius Mwelu Manyasi has been nominated to carry the Olympics torch on Thursday as it passes through Norwich. He will now join the other inspirational Kenyan Olympic torchbearers who include Legendary Paul Tergat, Nakumatts Holding MD Atul Shah, Kenya National of Women with AIDS director Asunta Wagura, and 2010 CNN Heroes award nominee and Anti-Jigger Campaigner Cecilia Mwangi. 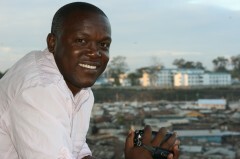 Born and bred in the slums of Mathare, Mwelu is founder and artistic director of the Mwelu Foundation. The foundation works to help youth in the slum realize their potential through photography and film production. He currently works as a photographer for the UN humanitarian news agency IRIN based in Nairobi.